While the glue is still drying, I made this radius sanding tool to keep me busy. 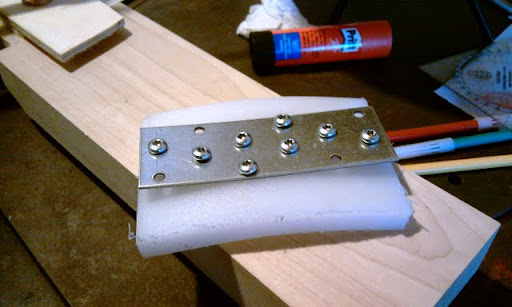 I screwed a slab of metal onto a chunk of acrylic or similar quite hard/resilient plastic of some sort (used to be a MinuteMaid chopping board) , dipped it in boiling water and used screws and a few washers to force it into a nice curve; it was easy to adjust it by turning the screws in various locations. I don't know what it is, though, I'd imagine it's something like 14" or so, not a very round radius but nothing like a flat shredder either; I just adjusted it to fit the radiuses of my guitars I like the best in that respect. Now that it's cooled down it stays put in the radius it was in when hot...I could have just left the screws and all on it for further adjustment later, but I figured I won't need it.